18 Jan So You Want A Kitchen Island? 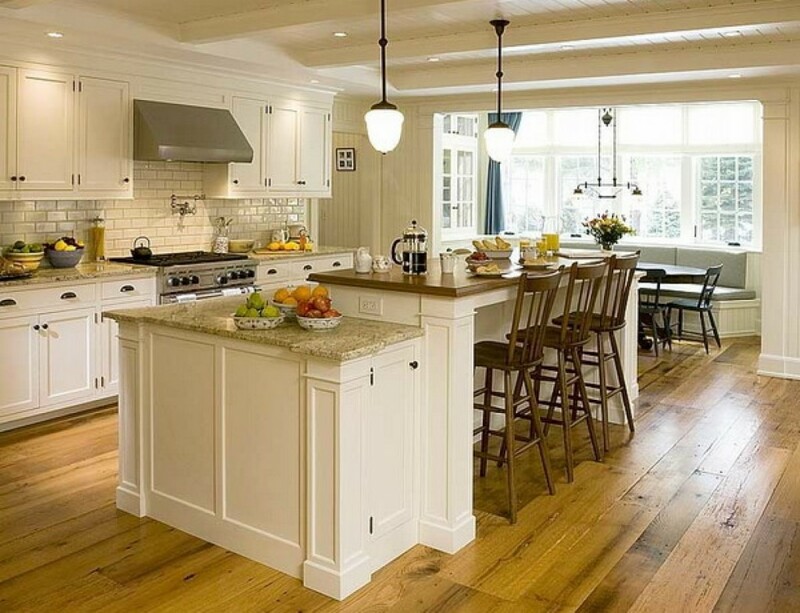 For the longest time, there has been a trend to have a island in your kitchen. From using a harvest table to cut your carrots on to multi-level kitchen islands of today where entertaining is key, kitchen islands have evolved greatly over the last 40 years. You have to keep in mind that not all kitchens have enough room for an island. Between the edge of the island and your existing cabinetry, you need 36” to move around it comfortably. As well, a kitchen island should be at least four feet long and two feet wide so you can accomplish the most simple of tasks on it. One of my favourite things about kitchen islands is their ability to hide large appliances. Ovens are easy to place underneath as well as dishwashers. If you’re considering having a dishwasher under your kitchen island, an extra expense since you’re need to plumb for it, why not add a sink as well and make the space even more practical. Depending on the size of your island really dictates what you can actually utilize it for. If your island is not really large, a cook top is not really going to be possible since they can take a lot of horizontal real estate. The design of your island really circles around what you plan on using it for. If you love to cook and watch your family and friends as they gather around, by all means consider the island a cooking centre. If you plan on using your island as a place to make drinks, ie a central bar, then the design should reflect this. As to what sort of lighting above the island is dictated by its utility. I find in general you are going to need some sort of task lighting. Whether the lighting are pendents or a large bank of lighting, you’re going to need something. The style of the lighting can be something completely different or something that blends, a very personal choice. 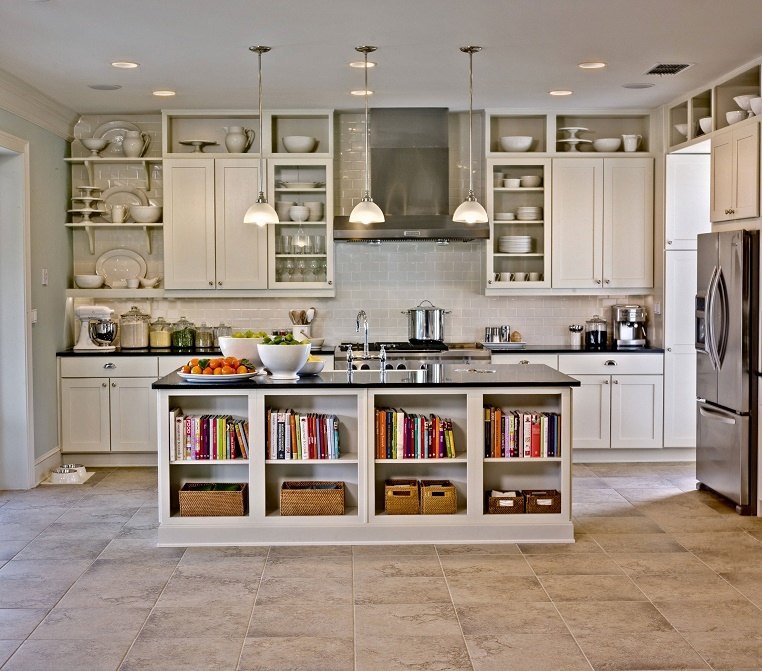 Speaking of style, your kitchen island can either mimic a piece of furniture. I’ve seen islands that look like a large harvest table with storage shelves underneath. Other versions are more like custom cabinetry that blends with existing cabinetry in the kitchen. Myself, I would prefer to have something completely different, a statement. Kitchen islands for me are one of the best things to hide things. I’ve seen the version where they have large shelves to put awkward pots or appliances like mixers. The only problem I have with storage like this is that you’re constantly cleaning and organizing the shelves since they are highly visible. With pull-out drawers,you can hide everything out of sight, neat and tidy. Ventilation is also a major consideration if you want to cook on your island. 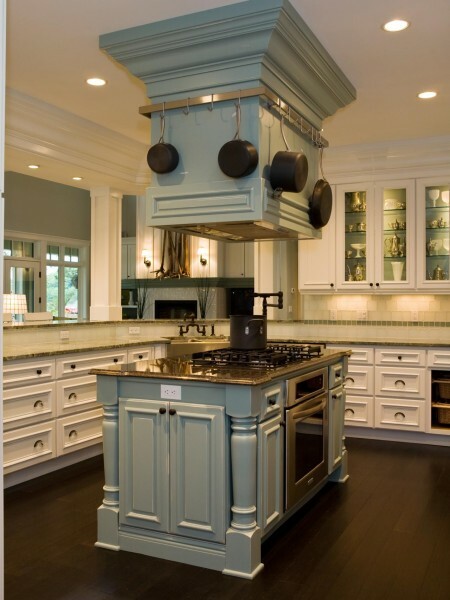 Whether you have a large hood above to remove the results of cooking or something in the counter such as a downdraft that either pops up or is static, the ventilation is essential. The worst part I find with a large hood above the island is that it disrupts the view beyond the kitchen which is usually the whole idea why you have an island. In all of the designer books, I’ve seen the use of different counter heights. These really have some great uses. If you plan on having people sit in front of the island, a counter similar to a bar would be perfect since they have have a drink or what have you as you cook. The different counter height is also great for hiding cooking messes from your guests so that all they see is you cook and not all of the clutter. 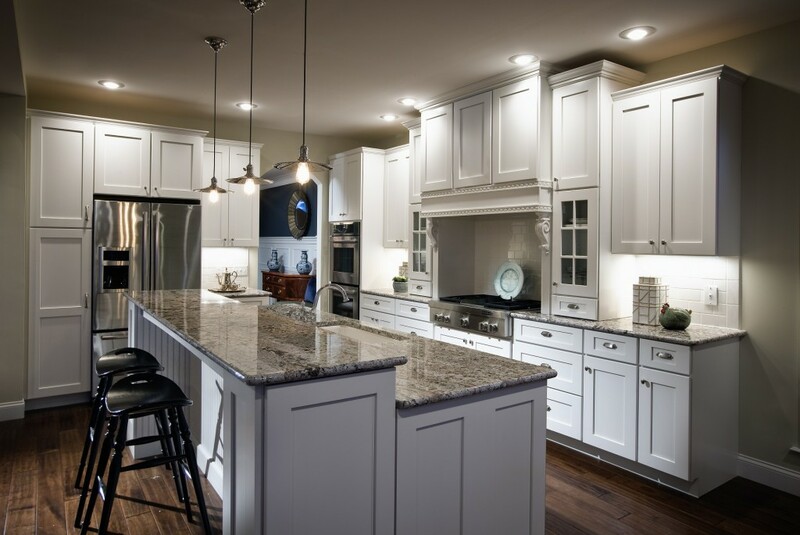 Depending on the configuration of your kitchen, an island can affect the movement in there considerably. Long islands are a great way of limiting entrance as well as delineating your kitchen from the rest of the house. Exploring counter tops, this is also another time to try something new and bold. Changing an entire kitchen when doing a renovation can sometimes be really expensive but by differentiating your island from the rest of the kitchen is a cost-effective way of adding a breath of fresh air so to speak. Why not try a really beautiful granite or perhaps a shocking white quartz or bold red man-made counter?